I was a cutman on a framing crew for about 7 years and I have used just about every major brand circular saw out there and the only thing that comes close to a magesium Makita saw is a regular Makita saw. No, I don’t work for Makita but this saw is the absolute best. At only 10 lbs, this bas boy has a powerful 15 amp motor that cuts anything in it’s path. This saw is capable of miter cuts 90 to 56 degrees with the flip of a lever. Remember those times trying to finish a job at about dark thirty and couldn’t see your cutline? This saw has an LED light that brightens up your line enabling you to cut in pitch black dark if needed. It also has a feature that blows the sawdust away from your cutline. 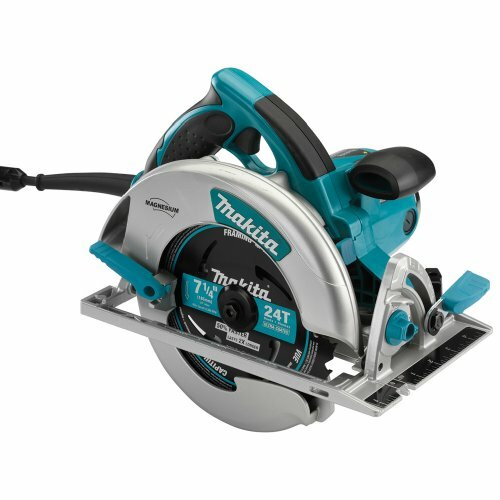 The Makita 5007MGA is basically the same saw, only has an electric brake for you guys that like to wedge your guard up. Priced at 149.99, it is a little more expensive than the competition, but paired wit ha Diablo blade by Freud, the Magnesium Makita is definitely the best on the market. I highly reccomend this saw to anyone from a DIYer that cuts something once a month to a Pro that builds houses every day. Makita is a brand that seems to run just under the radar. my Mak ROS has been a powerful workhorse for years. BTW, I recently installed a Freud thin kerf blade on an inexpensive Skil saw—it cuts like everything’s melting butter. When I find brands I can trust—I’m a buyer. No matter the price. it cuts like everything’s melting butter. Haha i like your comparison. I have the Makita 18 volt lithium Circular saw and jig saw. They both are excellent saws andcan’t be beat, especially since I do not cut all day with them. Also own 2 makita lithium drills and they are top notch. 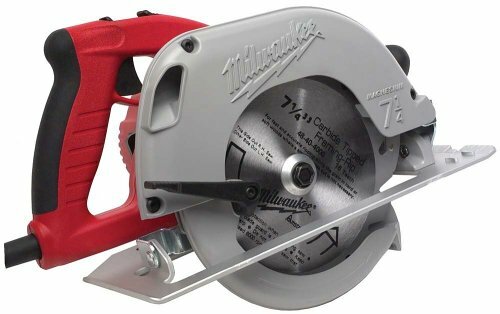 I am in the market for a new circ saw and had my mind set on milwaukee. I think that I will take another look at makita. Here is the review for Makita Vs Milwaukee. Great Power, Low Noise, No Vibration, Quick Stop Blade and Oversized Lever controls. However, It’s a bit dangerous. It is powerful, but binds real easy and kicks back like nothin’ I’ve ever seen. I’m afraid to use it. The blade is very thin kerf and the teeth are flush with the plane of the blade, so you should try a bit more agressive blade. All the adjustment are positive and easy to use. Can’t really use the guard lever because it takes your hand off the second grip, making it scary once again. Oh, the foot is super solid. The blade that came with the saw is quite good. Though the case is huge, it is sturdy and protects the saw very well. I have the corded Milwaukee (borrowed from a friend) right now and have been using it to break down sheet goods for chicken coop and built-ins projects and it is an absolute pleasure to use. I have used the angle adjustment for 45’s, very quick and accurate. I also love the depth adjustment system, again very easy, fast and accurate. With a thin kerf blade, and a good 8+ foot straight edge, I am getting extremely clean and straight cuts through 3/4” poplar ply with no tear out and no need for finish cuts. The saw is so powerful I ended up ripping/cross cutting pressure treated 2×8’s down to make better use of materials for some outdoor projects. Bottom line – excellent saw, I will be buying one. Blows my (smaller) 18v Dewalt away. I have the Porter cable in a left hand cut. I use the left handed one even though I am right handed and use it right handed. I do this because I grew up using a skil worm gear…and I like to be able to see the blade when I cut. I NEVER liked leaning over my saw to watch the cut line. I like many of the features these two saws have, and when my P/C wears out…I may look at them. I know that Milwaukee makes a corded left handed saw, does Makita ? The kick back you are experiencing from the Makita saw is probably from the blade you are using. The blade that comes with the saw is not a very high quality blade. Like I said in my review, I reccomend the Diablo blade by Freud. This blade drastically reduces kickback. Also I have used my Makita ripping and crosscutting boards 40-50 hours a week for about 7 years now and haven’t experienced any problems with it. I recall ripping 2×8 lumber all day long to make extra 2×4’s that we fell short on. I also have ripped plenty of treated 2×10’s to create the proper slope on many decks I have built that were supported by block pillars. Still cuttin’ strong. Don, to answer your question about the left-handed Makita, yes they do make one, or they did. Model #5007NLK has been discontinued. The only left-handed saws they still make are cordless or 5 1/2” saws. You might be able to find a reconditioned one from Makita or find one on e-bay. Makita is a good brand, I been looking at that saw for framing houses. Used Makita for 40 years, was available in NZ before it was in North America. The walls on my shop shudder if I bring in any other color other than Makita turquoise for power hand tools. Have looked at others however it always seems to come down to Makita after some research.